A heritage and lifetime of service to the Church stand behind Elder Joseph Bitner Wirthlin as he accepts the call to serve as an Assistant to the Council of the Twelve. Looking back, Elder Wirthlin sees preparation for the call beginning with service in Aaronic Priesthood quorums, as a Scout (he holds the rank of Eagle), and especially in his home, with a father, Joseph L. Wirthlin, who served in the Presiding Bishopric for 23 years. Elder Wirthlin was also very active in athletics. He lettered in high school football, basketball, and track in Salt Lake City and also lettered in football at the University of Utah. He considers the discipline, sportsmanship, and other qualities thus learned a special molding force in his life. His preparation continued as he served in many Church callings﻿—as a missionary in Germany, Austria, and Switzerland; as a bishop, high councilor, counselor in a stake presidency, and most recently as first counselor in the general presidency of the Sunday School. He now considers “the most wonderful part” of this new calling the chance to devote himself full time to the Church. Besides this Church background, Elder Wirthlin brings to his position experience and success in business. (He credits much of his business knowledge to his experience with his father.) He is president of Wirthlin’s, Inc., and a partner in the JLW Company. He has been president of the Utah Grocers Association and also of the Utah Meat Purveyors Association. Elder Wirthlin has passed on his heritage to his children, who are all active in the Church, and who have had the chance to work with him in his business. “And they have always supported us in every way in our Church callings,” he said. He has seven daughters and one son, a bishop, who now manages his business. His wife, Elisa, president of the Salt Lake Bonneville Stake Relief Society, calls him a “wonderful husband and tremendous father. Whenever he was given an assignment, he aimed at perfection, taking care of every minute detail. I’ve always known he was worthy and qualified to serve the Lord in any capacity,” she says. 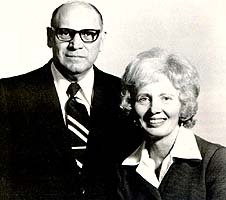 Elder Wirthlin returns the compliment by noting that his wife has never resigned from a Church calling, even when she was having their children.